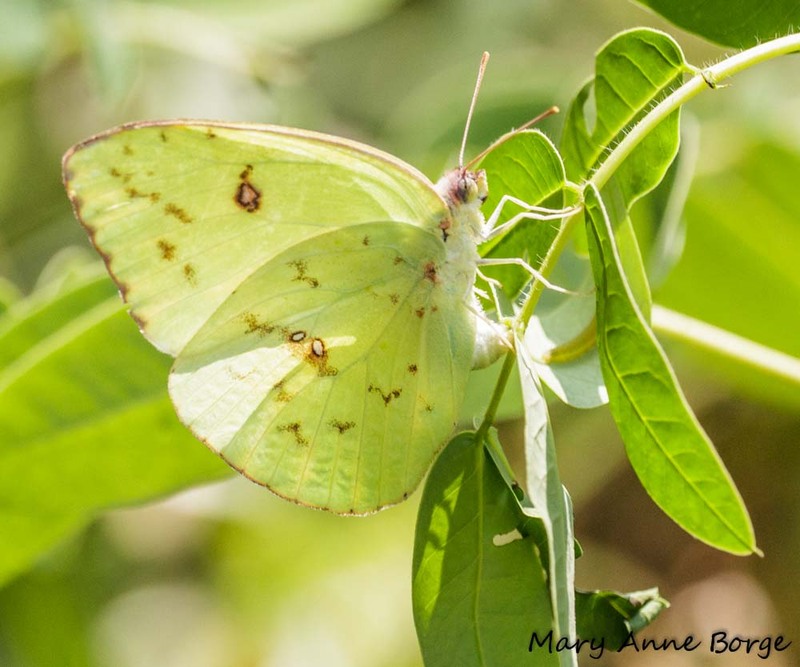 Very common in the southern United States and Mexico, Cloudless Sulphur butterflies (Phoebis sennae) are much more rare in the northern states and Canada, at least until late in the summer when some individuals pursue their annual dispersal … north? For the past few weeks I’ve been seeing them at Bowman’s Hill Wildflower Preserve, near New Hope, in the central part of eastern Pennsylvania. Look for them flying rapidly while cruising for mates, hunting for caterpillar food plants and laying eggs, or nectaring. The butterflies I’ve seen have been so busy with the first two activities that I haven’t seen much nectaring. 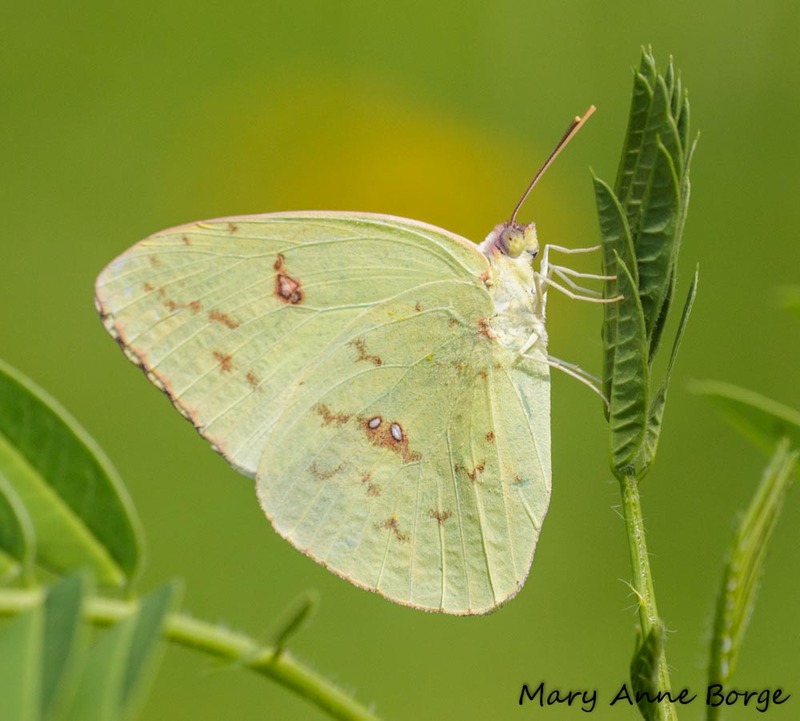 Cloudless Sulphurs specialize on pea family members, primarily Sennas and closely related plants like Partridge Pea (Chamaecrista fasciculata) and Wild Sensitive-plant (C. nictitans) as food plants for their caterpillars. At Bowman’s Hill Wildflower Preserve the Cloudless Sulphurs seem to prefer Wild Senna (Senna hebecarpa, S. marilandica). Partridge Pea is also available here, although not as plentiful, but I haven’t yet seen them use it as a caterpillar food plant. 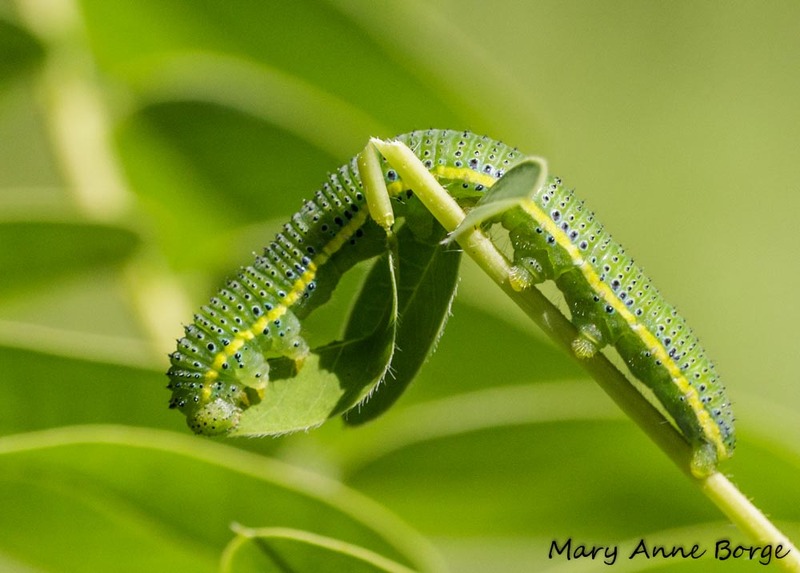 The caterpillars’ coloration blends perfectly with their food plants, varying from yellow to green. 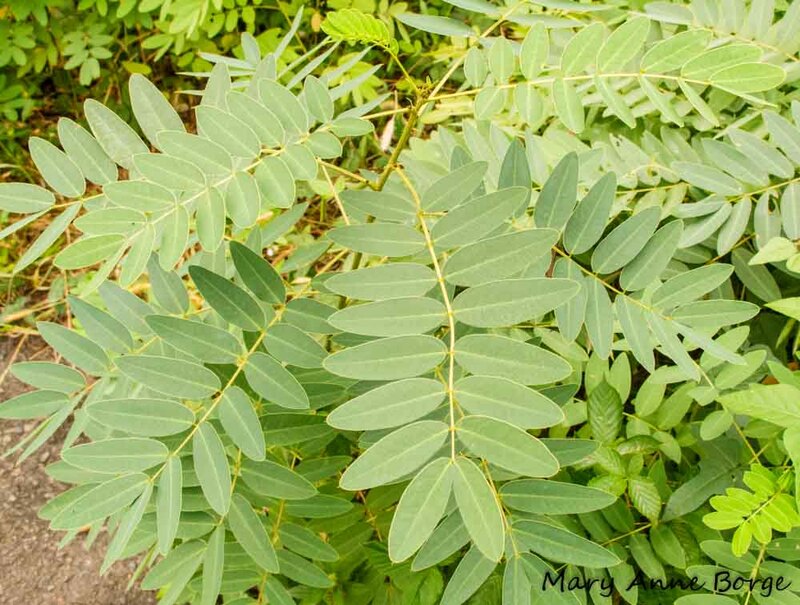 At this location, their overall green background is an exact match for the color of the Wild Senna leaves on which they’re feeding. 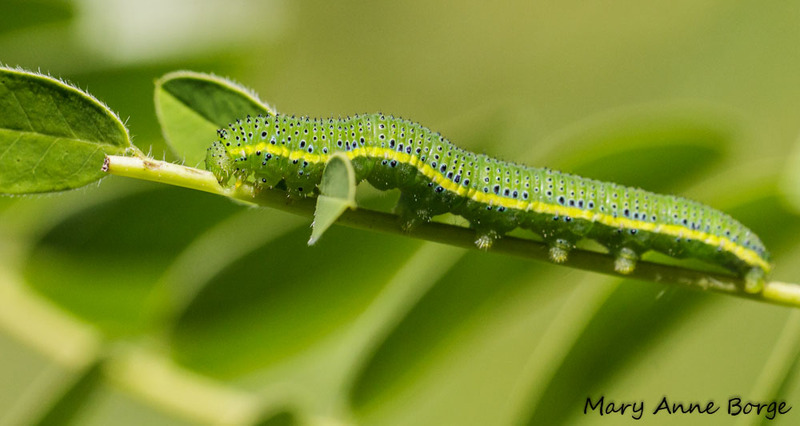 The yellow stripe along the length of the caterpillar’s body resembles the leaf mid-rib, where they can be seen resting or feeding. This camouflage makes it much harder for a hungry bird to spot them! 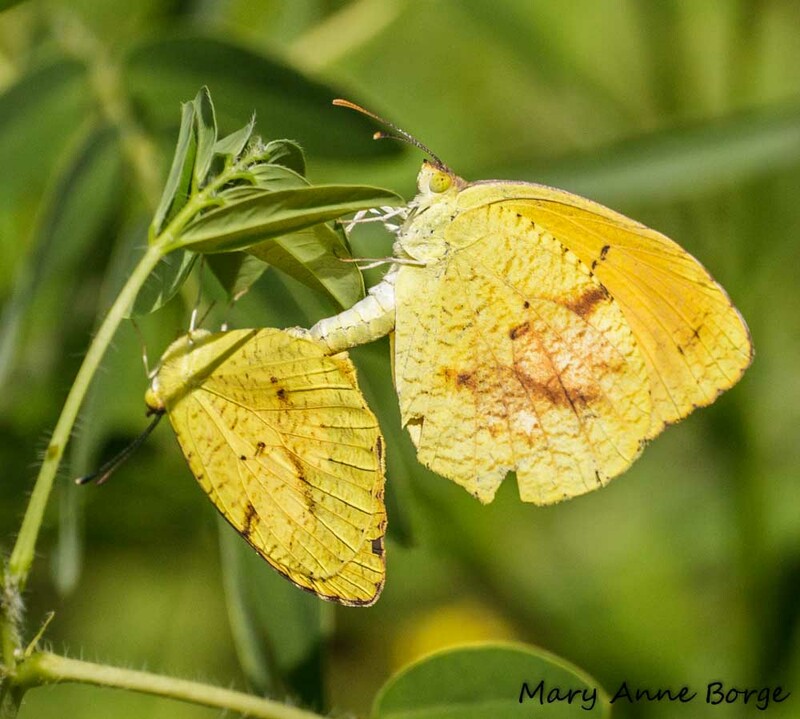 At Bowman’s Hill Wildflower Preserve they are sharing a habitat with Sleepy Orange butterflies, who are usually resident here from July through September, nectaring on a broad variety of flowers, mating, and laying eggs. In the photo below, a Cloudless Sulphur is laying an egg directly opposite a leaf where a Sleepy Orange caterpillar is hiding. 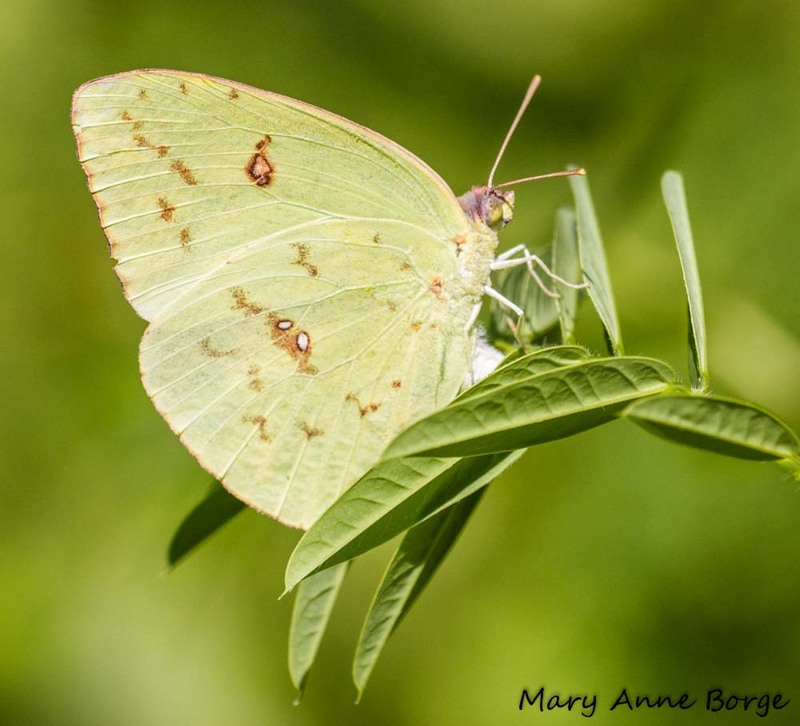 These two butterfly species have a lot in common. 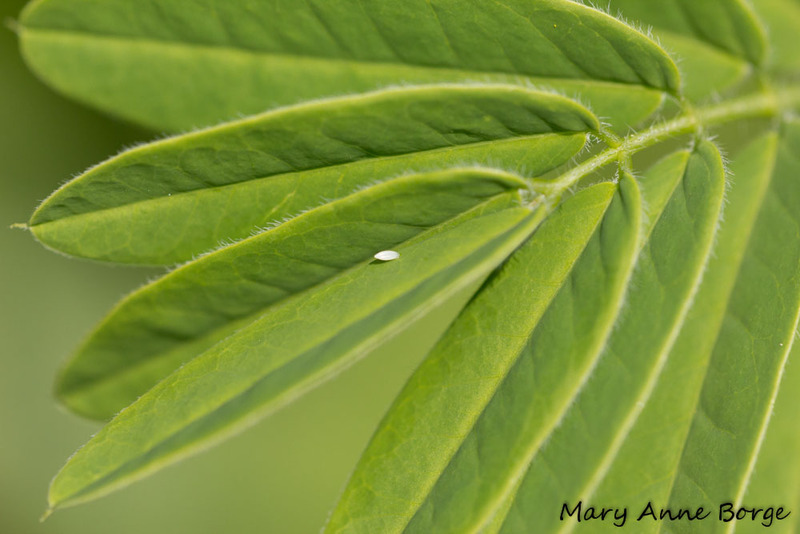 Sleepy Oranges use the same food plants for their caterpillars, and I have so far seen the same preference for Wild Senna rather than Partridge Pea at this location. Both Cloudless Sulphurs and Sleepy Oranges seem to prefer using younger plants as caterpillar host plants. Like Sleepy Oranges, Cloudless Sulphurs are primarily a tropical species. Their range goes as far south as Argentina. In the moderate temperatures of a southern winter, they survive as adults, mostly inactive, but feeding occasionally. 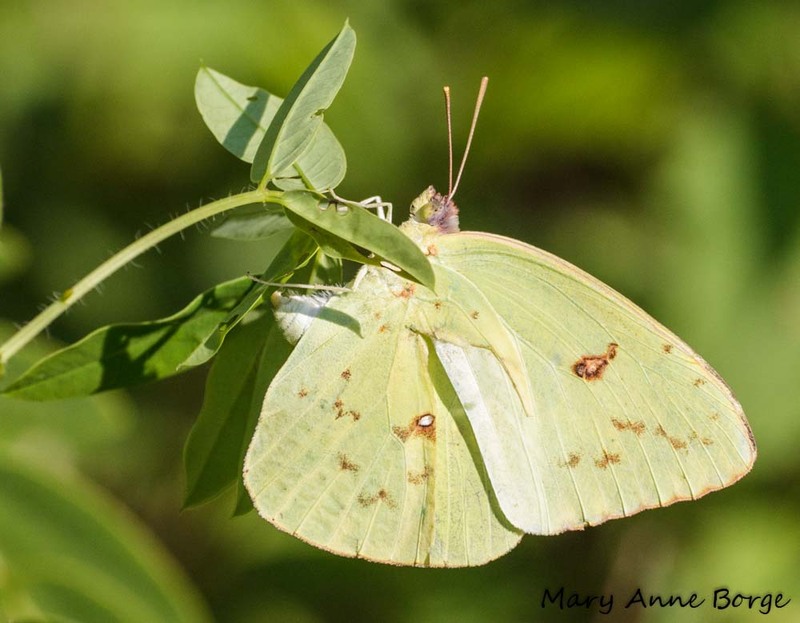 They are somewhat cold tolerant, flying in fairly cool temperatures for butterflies. But these bright, sprightly butterflies have an adventurer’s genes. Most years, some individuals move northward, sometimes reaching as far as Ontario province in Canada, in spite of the fact that they can’t currently survive sustained cold winter temperatures. At least, as far as we know, they can’t. So why do Cloudless Sulphurs keep pushing north every year if they can’t survive sustained periods of cold winter weather? How is this beneficial to the species’ continued existence? A species that can subsist over a broad geographic range in diverse habitats is in a better position to survive over time than one that is more narrowly focused. If something happens to make one part of the range or habitat inhospitable, the species has many other options for locations that will accommodate their continued existance. The larger a species’ population becomes, and the more diverse the environments to which segments of the population are exposed, the more genetic mutations will result in individuals. If the same genetic mutation occurs frequently enough, it may lead to an evolutionary change in the species. Cloudless Sulphurs have evolved so that many of those that head north (or their offspring) make a return southward fall migration, spending the winter in a warm southern climate. But some Cloudless Sulphurs continue to move north in late summer and fall, and probably die when the cold winter sets in. But two things could happen to make this exploration of new territory a worthwhile effort for the species. Warming temperatures could eventually make some of this northern territory moderate enough for the Cloudless Sulphurs to survive the winters as they do in the south. Or a genetic mutation could occur in the Cloudless Sulphurs that leads to an evolutionary change, enabling them to survive a cold northern winter. 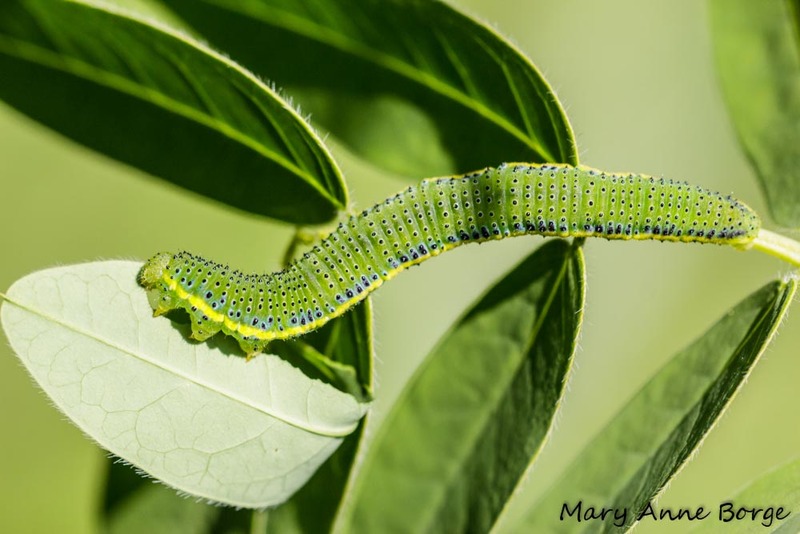 Their caterpillar food plants, Wild Sennas, are available to support them as far north as Ontario and all of the northeastern United States. Scott, James A. The Butterflies of North America. 1986. 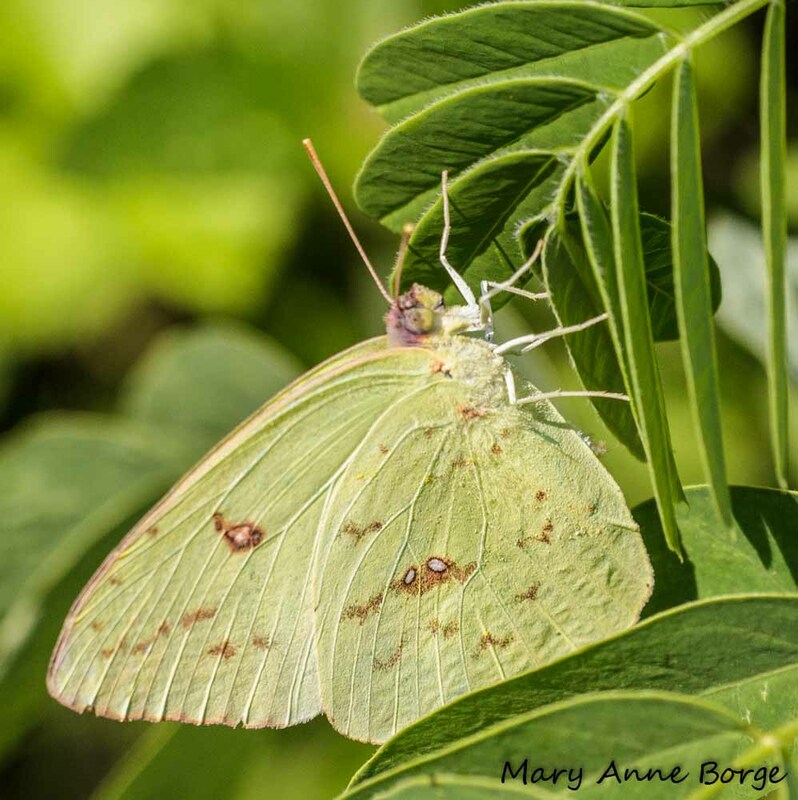 This entry was posted in Butterflies, Native Plants and tagged Butterfly migration, Cloudless Sulphur, Evolution, Migration, nature, Phoebis sennae, Senna hebecarpa, Senna marilandica, Wild Senna by Mary Anne Borge. Bookmark the permalink.